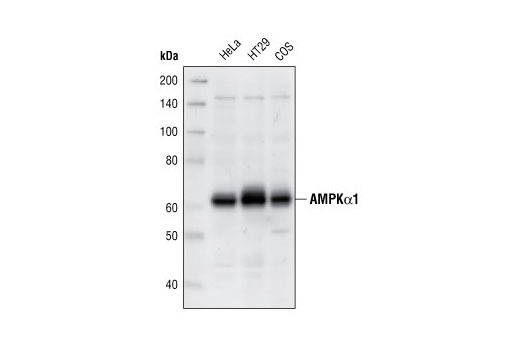 Western blot analysis of extracts from HeLa, HT29 and COS cells, using AMPKα1 Antibody. 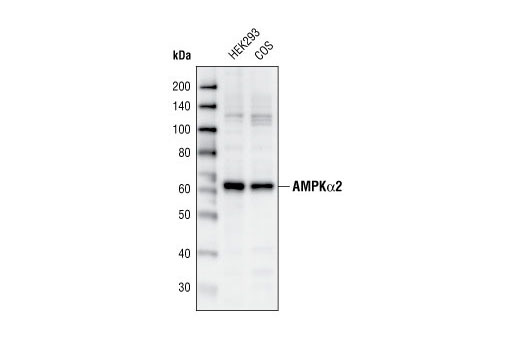 Western blot analysis of extracts from HEK293 and COS cells, using AMPKα2 Antibody. 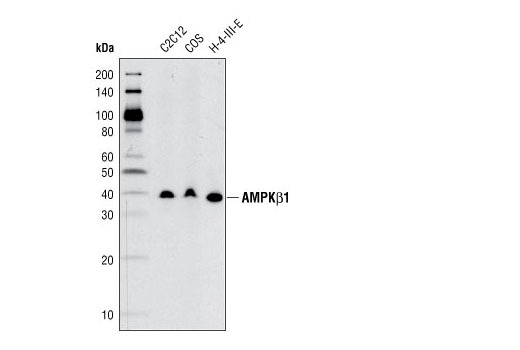 Western blot analysis of extracts from various cell types using AMPKβ1 (71C10) Rabbit mAb. 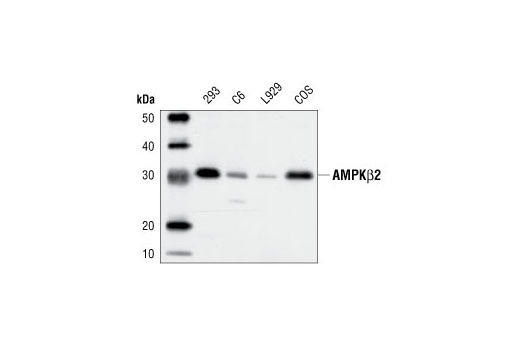 Western blot analysis of extracts from 293, C6, L929 and COS cells, using AMPKβ2 Antibody. 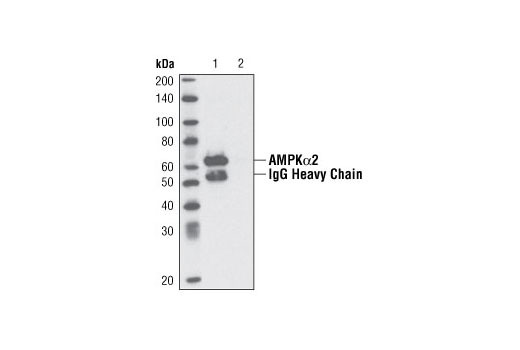 Immunprecipitation of AMPK alpha 2 from 293 cell extracts using AMPK alpha 2 antibody (Lane 1). Lane 2: No antibody control. 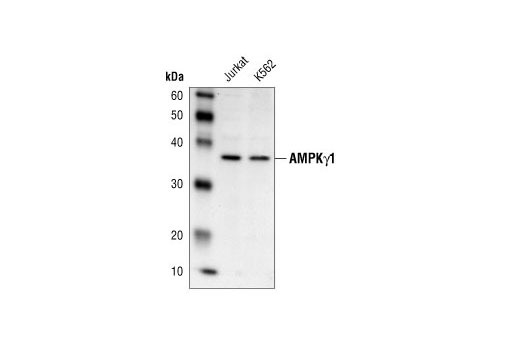 The AMPK Subunit Antibody Sampler Kit provides an economical means to investigate the role played by all AMPK subunits in cellular energy homeostasis. The kit contains enough primary and secondary antibodies to perform two Western blots with each antibody. 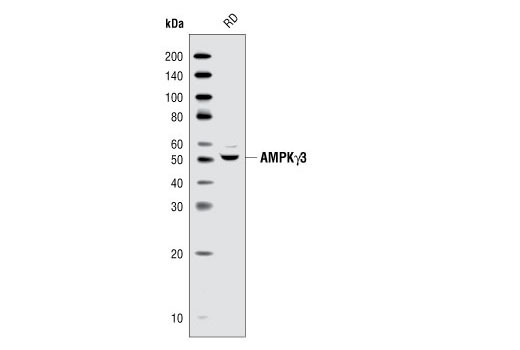 Each of the antibodies in the AMPK Subunit Antibody Sampler Kit detects endogenous levels of the specified AMPK protein. 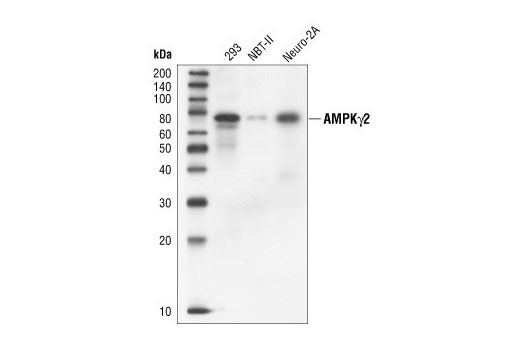 Antibodies do not cross-react with related AMPK subunit proteins. corresponding to residues surrounding Ser500 of human AMPKα2, near the amino terminus of human AMPKγ1, surrounding Ser60 of human AMPKγ2, and corresponding to the sequences of human AMPKβ2 and AMPKγ3. 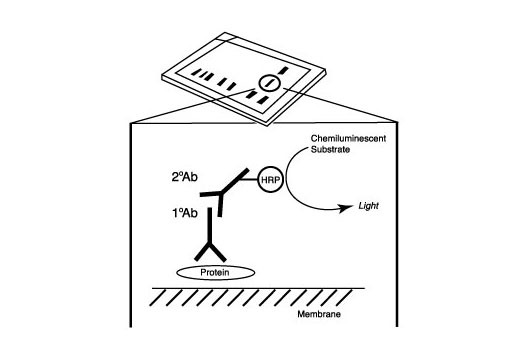 Antibodies are purified by protein A and peptide affinity chromatography. Monoclonal antibody is produced by immunizing animals with synthetic peptides corresponding to residues surrounding Val176 of human AMPKβ1. Tzatsos, A. and Kandror, K.V. (2006) Mol Cell Biol 26, 63-76. Zou, M. H. et al. (2002) . The Journal of Biological Chemistry 277 (36), 32552-32557. Ouchi, N. et al. (2004) . The Journal of Biological Chemistry 279 (2), 1304-1309. Göransson, O. et al. (2007) J Biol Chem 282, 32549-60. Zou, M. H. et al. (2003) . The Journal of Biological Chemistry 278 (36), 34003-34010. Liang, J. et al. (2007) Nat Cell Biol 9, 218-24. Zakikhani, M. et al. (2006) Cancer Res 66, 10269-73. Aguilar, V. et al. (2007) Cell Metab 5, 476-87. Pilon, G. et al. (2004) . The Journal of Biological Chemistry 279 (20), 20767-20774.